Reishi is an exceptional Chinese mushroom that has long been highly rated in traditional Chinese medicine as a cure-all and has been used in the treatment of a variety of disorders. It is believed to promote health and longevity and to be the best booster of the body's immunity against diseases. 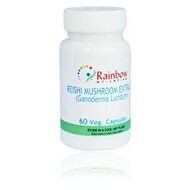 Reishi contains germanium and is considered to have a powerful effect against tumours and cancers. Recent research has found reishi to be beneficial in relieving fatigue and stress, treating viral infections and joint inflammations, lowering high cholesterol and triglycerides, reducing heart disease symptoms, regnerating the liver, alleviating allergies, calming the nervous system, helping with the treatment of diabetes and reducing the side effects of chemotherapy. Each vegetable capsule contains 400mg of 100% Pure Reishi Extract (standardised to 20% polysaccharides). No additives or fills of any kind.